Back near our home turf on a day with a Slight Risk and 2% tornado across East Texas through Louisiana and into Mississippi. Storms fired along an outflow boundary east of Waco and quickly grew to severe limits producing strong winds and a brilliant lightning display in the town of Calvert. We dropped south as storms kept firing in a cluster of supercells. As outflow from a storm to the west interacted with a cell south of Hearne, a brief spin-up tornado occurred, last approximately 60 seconds. New group in today. One target, Northeast Colorado with a Slight Risk and 2% tornado. Told the group to get to sleep early. Got up at 4am and started the 800 mile drive to the days. 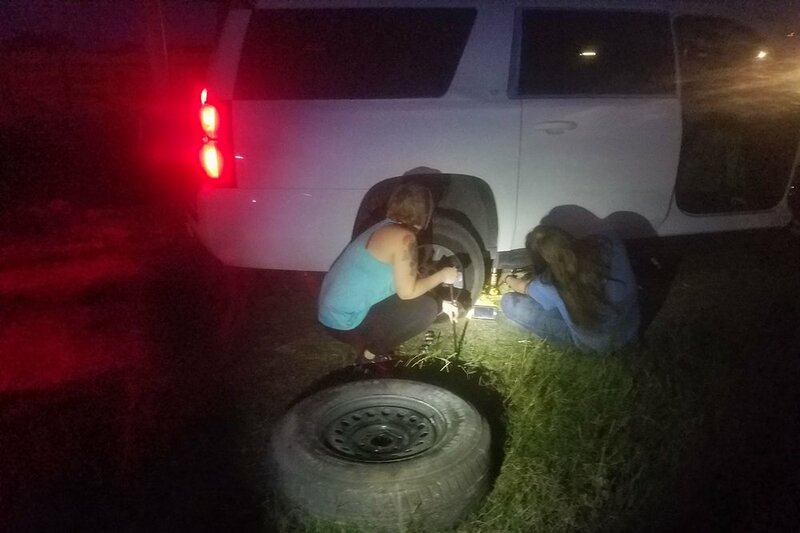 Immediately blew a tire, because of course we did. Spare got us to Norman where we begged Firestone to rush us through. They had us out in about 30 minutes. You guys rock! Watched the storm go up on approach into Colorado. It went tornado warned as we got to Last Chance. Brilliant green glow, but super HP. Ended up getting near some giant hail, a big wall cloud, gustnado, and topped it off with an insane shelf cloud. Two viable targets. Ahead of the cold front in South Texas, where SPC had a Slight Risk on the Rio Grande with a 2% tornado. Opted for the Marginal risk in the Panhandles for better photo opportunities in an upslope regime. Storms had pretty coloring and some decent lightning up until about sunset when one just exploded, made an attempt at becoming surface based with some nice structure and excellent close range cloud to ground lightning. New group’s first day. Enhanced Risk with a 5% tornado risk across Oklahoma, down into Texas, and up into Missouri. Tornadoes continue. Our storm went from elevated mess, to surface based, to tornado on the ground in a matter of minutes. We only got a glimpse of it before it became rain wrapped. Thankfully the lightning illuminated it. Sixth tornado of the week, another needle in the haystack for our guests. We kept chasing into the night and got and up close view of a nocturnal wall cloud spitting out CG’s as it came into the town of Mill Creek, Oklahoma. Multiple supercells and tornado warnings this afternoon/evening. A day that started out hyped up to be a tornado outbreak ultimately underperformed and left most chasers frustrated. The day had a rare High Risk issued for severe weather with a 30% hatched area for significant tornadoes in Oklahoma and Kansas. All of the ingredients were present for a highly volatile day; 4500 CAPE, 65 knots of bulk shear, rich dewpoints, etc. The problem was that forcing along the dryline overcame the weak cap too quickly. Storms all went up at once and were quickly severe warned for giant hail (4”). As we dodged hail cores around the Woodward area, we noticed a storm taking shape about 50 miles to our east that was isolated enough to not be an HP mess. We raced towards it as the first tornado warning went out. Confirmed tornado. As we approached on Highway 412, we could see a very pronounced collar cloud around the base of the mesocyclone, but the tornado was wrapped heavily in rain. It crossed the road in front of us before finally emerging from the precip. The tornado was on the ground for 30 minutes south of the town of Waynoka. It lifted before going through town, leaving minimal damage behind. May 16, 2017 - five tornadoes for guests in texas and oklahoma. including ef3 in elk city. This was our first day of organized tours for 2017. We targeted along the dryline on the Texas/Oklahoma border. Storm Prediction Center had an Enhanced Risk up and down the dryline from Texas into Kansas (as well as a few other areas across the country). The 10% hatch for significant tornadoes seemed warranted with 3500 MUCAPE and 45 knots of shear in place. A moderately strong EML (the cap) was in place but was weakening when we arrived in McLean, Texas. The storm approached from the west and spun up a rope tornado which was on the ground for 15-20 minutes. The amount of chasers on the storm as it moved into town was high, so we bailed south to newly developing storms along the dryline. This was kind of a funky day. We started out in Matador, Texas. Storms went up pretty early and one quickly became dominant and a very messy HP supercell. Then headed up into Oklahoma. We decided to bail on it as the crowds of chasers and mode made it less than enticing. Then it was a lot of sitting around and waiting. We found a good hill to sit on and watch the sky. After a couple hours of clouds clearing and heating a new LP storm fired off the dryline. We watched it quickly become surface based and acquire rotation. We were one of just a handful of chasers left in the area as most followed the other storm way north. NWS issued a tornado warning, although it did not produce initially. 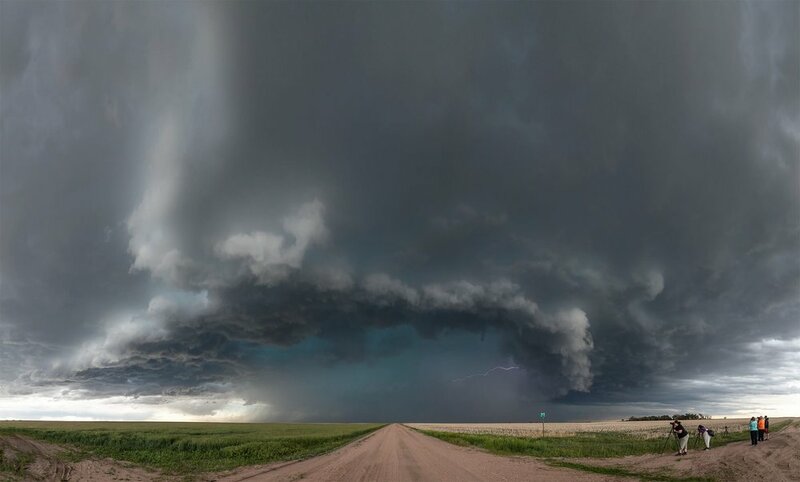 The storm transitioned into a photogenic supercell with classic structure. Near dark, and after several hours of chasing the storm did produce a brief tornado, which we witnessed in Loveland, Oklahoma. 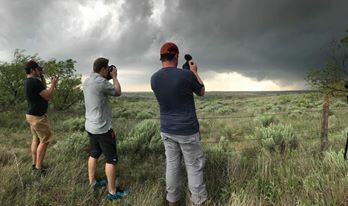 We followed a tornado warned supercell for about 5 hours from Loving, New Mexico to Whiteface, Texas. The structure once it hit the border was insane. The atmosphere was forecast to be moderately unstable with MLCAPE around 1500 J/kg and effective bulk shear in excess of 40 knots. The chances looked solid for a tornado given sufficient low-level shear/hodograph curvature and moisture. Cap issues plagued the day, limiting storm formation/strength until late in the afternoon. A supercell did finally break through in far eastern New Mexico and tried very hard to spin up a tornado, but could only produce a few short lived funnel clouds. Unofficially kicking off our storm chase season, we targeted the open warm sector in Van Zandt County, Texas where shear was a little better and the chances were better for semi-discrete storms. . The Storm Prediction Center had an Enhanced Risk with a very broad 5% tornado area stretching across multiple states from Northeast Texas through Louisiana, Arkansas, Oklahoma, Missouri, and into Indiana. Expectations weren’t high for the day but things quickly evolved as we arrived in Gun Barrel City, Texas. Storms started firing to the south and moving north. Surprisingly, they quickly acquired rotation and we followed a large wall cloud through the town of Malakoff. Then tornadoes started dropping. A rare occasion where we had tornado warnings before a watch was issued. We observed an EF4 tornado on the west side of Canton. That tornado occluded and was replaced by another large tornado, which would be rated EF3. The area is heavily wooded, making chasing and observation challenging. We repositioned hoping to approach from the tornado from the south on Highway 64, but it was heavily wrapped in rain when it crossed the road about a quarter mile in front of us. The smell of dirt and shredded pine trees filled the air. Everything was destroyed around us, including multiple homes. The chase was over and we were in search and rescue mode. You might notice a lot of storm chase tours start in early April or even March! For me, the frequency of quality severe weather setups is not high enough to warrant asking for people’s hard earned money to go storm chasing this time of year. Instead, we run Texas Bluebonnet (wildflower) Photography Workshops and Tours. We see upwards of 200 guests per year. For me, it will be hard to top March 24, 2017. The Storm Prediction Center had an Enhanced Risk with a 5% tornado probability for Eastern Texas into Louisiana. That far east would be a hard sell for a bluebonnet tour though! I focused on where we could see severe weather over wildflower fields. Brenham appeared to have a good shot for late afternoon and I knew of several fields there. We picked up the afternoon tour and got on developing storms east of Austin and chased them as they went severe warned into Washington County. Ended up at a massive field of wildflowers at dusk for a rare photo opportunity.